When a good friend of mine went out to Minneapolis back in 2010, he came back with a frustrated lament of not being able to find many good coffee spots in the city. Having since scoured the City of Lakes coffee scene in my own adventures, I found his complaint emptier by the coffee stop. One of the glorious and slightly accidental finds was Spyhouse Coffee & Espresso on Nicollet Avenue. I had done my research prior to my arrival in the city but I did not find contentment in my final list, so on the fly I did a quick internet search for coffee nearby and BAM, I spotted Spyhouse. The qualifications spoken on their website closed the sale and I soon found myself standing outside their rather spacious corner shop, complete with an outdoor seating area that could charm most to forsake the AC. Moving inside, the digs proved visually enticing as well, with jazzy furniture, great lighting and lots of interesting art pieces. The coffee comes from three excellent roasters: Ritual, Verve and Coava. I had Verve's Street Level via espresso and Ritual's Monte Copey Costa Rica via Cafe Solo. The espresso, pulled short with brown crema, trumpeted delicious notes of dark cocoa, lemon, ginger, coriander and flecks of spinach and rare steak. The Costa Rican delivered cranberry, vanilla wafer, romaine, peanuts and a little caramel, all combined in a mellow yet vibrant brew. Both drinks proved well-crafted and delicious. I count my blessings that I was able to experience some great coffee in one of their outfits. 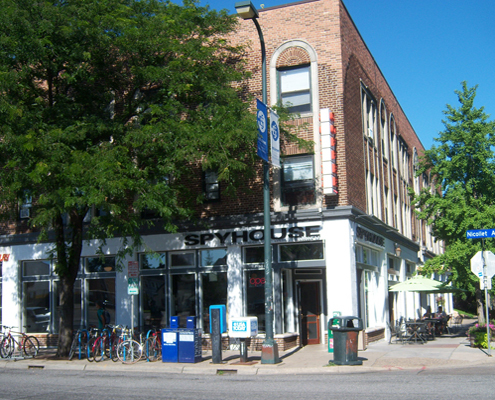 Unlike my friend, make it a point to spy out a Spyhouse location when you're in Minneapolis. I was in Minneapolis on holiday about a year ago and I would have loved to go to Spyhouse - I don't remember Nicollet Avenue though... Maybe next time! Coffee has always been my favourite drink. It seems to boost my energy. But truly speaking, I never knew that coffee has such an amazing history. Thanks lot, for sharing it. Dogs, cats, hamsters, fish, parrots - who do you prefer? Or dialect mayhap what that odd animals - snakes, crocodiles, lizards, monkeys? worth a stop on my next Northern route cross country road trip. Spyhouse.